Offero's motto is: "drink. differently" and their line of coffee mugs, wine glasses, and beer glasses shows a distinctively different shape designed to enhance the beverage drinking experience. I was contacted by Offero's designer and owner, Mitch Bangert, to see if I would be interested in reviewing one of their glass designs. I was up for the task and he sent me two complimentary Omnis glasses. The Omnis glass comes in both 12oz stemmed and stemless models. While Offero promotes their stemmed Omnis glass as being made specifically for beer drinking, they were temporarily out of those glasses for review and instead offered me a stemless version of the glass to try out. I chose to test out this new Omnis glass by doing a side-by-side comparison along with two other beer glass shapes - a snifter like glass and a tulip glass. I wanted to test out what the differences were between all three glasses to see which one brought out the best drinking experience. Each glass had it's own unique shape, but which glass would work out best? I chose to try a hoppy pale ale (Sun King Osiris) as my test beer and poured equal amounts of it from a 16oz can into each of the three glasses. I wanted to compare the feel and use of the glass, the aroma of the beer, and the overall taste of the beer from each glass. Since the other two glasses were stemmed, I tried to use each glass as if they did not have a stem. Which one would come out on top? Each of the three glasses had a wider lower and narrower upper sections to the glass. The Offero Omnis glass was wide at the base and gently tapered a bit towards the top. The top of the glass was noticeably cut at about a 45 degree angle. This shape was designed to help trap more of the aromas from the beer, get your nose surrounded by the glass and enhance the experience. 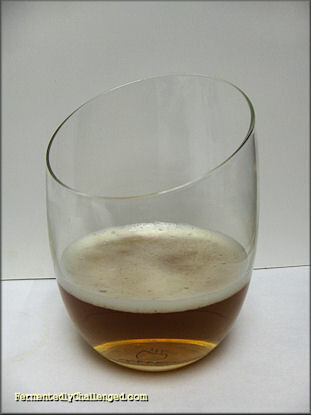 Both the snifter and the tulip glasses had a proportionally larger round base and a narrower opening near the top. The tulip glass had the narrowest opening and flared out at the top. I chose to grasp each glass by the bottom of the glass where the liquid resided. I tried not to use the stem on the snifter and tulip glass as to be more similar in it's grasp to the Omnis. 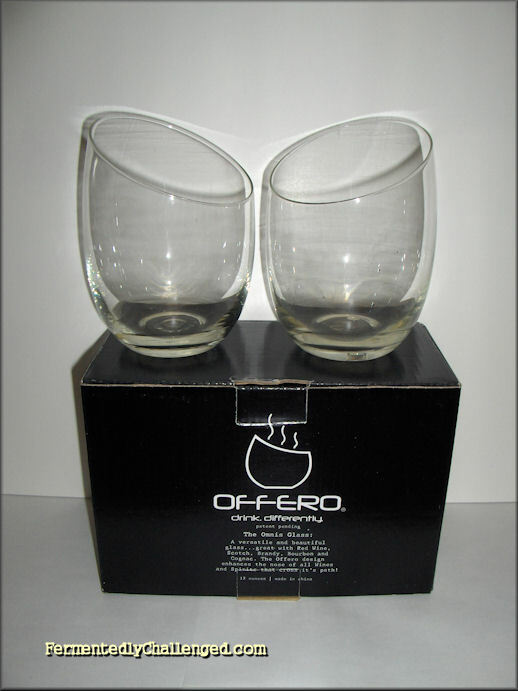 The Offero Omnis glass and the Snifter glass had the biggest bases to hold and I felt comfortable grasping each one. I was able to swirl each beer comfortably in each glass, however the smaller tulip glass was probably the easiest glass to swirl given its smaller size. Each of these glasses were designed to hold 12oz of beer comfortably, but I'd suggest a 10oz sample in each in order to attempt any vigorous swirling without a big risk of spilling. The thickness of the Omnis glass was comparable to the other two glasses. It didn't seem overly thin and was quite thick on the bottom. Sitting by itself on a table, the Omnis glass seemed quite stable and would seem hard to accidentally tip over if bumped. I couldn't say the same thing for the snifter or tulip glass however. So if you want to avoid accidental spills, choose a stemless glass. Here's where things got interesting. When I held up the Omnis glass for a sniff, I found that the shape of the glass formed a mask like covering for my nose. The taller end of the top actually ended up pressing on my forehead and I was able to get a huge smell of hops from the pale ale. This seems to be both an advantage and a disadvantage. The disadvantage comes from the fact that I felt that I had to touch the glass to my forehead in a natural attempt to stick my nose into the glass. Things got a bit more complicated when I put on my glasses and tried to take a sniff. The glass bumped up against my glasses and was a bit clumsy to do at first. It would become even more noticeable when I went to take a taste of the beer. The snifter glass covered my nose well also, but the tulip glass left a bit more open air around the nose when taking a deep smell from the top of the glass. 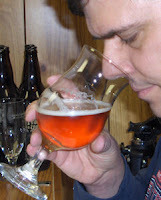 I took several trials of sniffing each beer and found that both the snifter and the Omnis glass gave much better aroma sensations than the tulip glass. I knew right away that the Omnis glass was a better choice for smelling the beer over the tulip. However, it was difficult to distinguish a difference in aroma from the snifter glass verses the Omnis glass. Both were very similar. In my several years of sampling and reviewing beers from many different glasses, I've found that the glass does indeed affect the taste of a good beer. Having a full rich aroma trapping glass does enhance the overall satisfaction of the beer. In addition, temperature also has an affect on the taste. In each taste sample, I got a more richer taste from both the Omnis and the Snifter glass. The tulip glass didn't have quite the satisfying taste as the other two did. I quickly discarded the tulip glass for the remainder of the tests as I knew that glass wasn't quite up to this particular beer for flavor. One thing I also noticed about the Omnis glass was that the beer tended to warm more quickly in that glass than in the Snifter or Tulip glass. This was noticeable after a few minutes and even more so after several minutes. Yet, even though the beer was got warmer quicker in the Omnis glass, I found that a bigger flavor started coming out of the pale ale as it warmed up. For some beers, like dark stouts, letting the beer warm up is important to bring out the full flavor and aroma. Some lighter styles however, are better drank colder, but in this case, the pale ale tasted just as good cold as a bit warmed up. 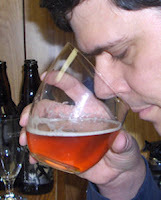 As I started to finish the last of the 5oz sample in my Omnis glass, I noticed that I had to greatly tip back my head in order to get the last ounce or so out of the glass, whereas the snifter glass allowed me to finish the sample without having to tilt back my head quite as much. It's because of the design of the Omnis glass and the fact that it essentially hits your forehead as you take a sip that forces you to tilt back in order to finish my drink. And with my glasses on, I ended up having to tip my head back even further. I definitely enjoyed the taste of the beer out of the Offero Omnis glass as it enhanced the aroma of the beer and tasted good both cold and as it warmed the beer slightly. Not having a stem on this glass didn't take away from the overall experience, although I believe those with small hands may wish to choose the stemmed version in order to get a better grip on the glass. 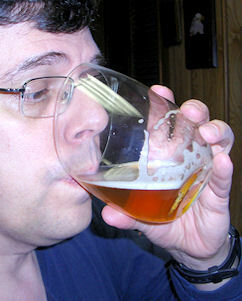 For me, having to wear eye glasses most of the time, it felt a bit odd having to press the top of the glass and rest it on my glasses while I drank. And having to tip back my head a lot more to finish my beer did seem a bit more unusual, but wasn't too uncomfortable. But those who have a stiff neck my prefer to choose a snifter glass to avoid that. I had heard that Black Shirt Brewing was considering using these glasses exclusively at their soon to open Denver-based brewery. I wrote to them and asked their impression of the beer. They stated that they really loved these glasses. When asked if they saw any drawbacks to the Offero Omnis glass, they stated that on occasion they spilled a little beer out as the shape of the glass being lifted and tipped to their mouth sometimes caused them to "miss" getting their mouth firmly on the glass before the beer reached the rim, but this is just a one time learning experience and once you get used to the glass that didn't happen again. So they plan on "educating" their customers before giving them the glass for the first time. As for my final opinion on this, the glass is definitely a discussion starter due to its sloped shape. 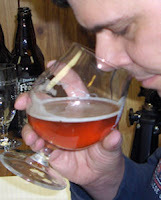 It does help bring out the aromas well in several types of beer. I tried it with a pale ale, a sour ale and a wheat beer. In every case I could really get a good full aromatic experience out of the glass. And for me, if I can smell my beer better it tends to taste a bit better too. So don't let the odd shape put you off. It may take a little getting used to, but the beer still tastes great in this glass. - Crooked Stave Blackberry Petite Sour review (Omnis glass). - Breckenridge Agave Wheat review (Omnis glass). - Firestone Walker Velvet Merlin Oatmeal Stout review (Omnis glass).